Tune Out is a microgame found in the Touch Training stage in WarioWare: Touched! There is also a souvenir based on this microgame called Piano. Tune Out reappears in WarioWare Gold, where it is one of Kat and Ana's microgames. 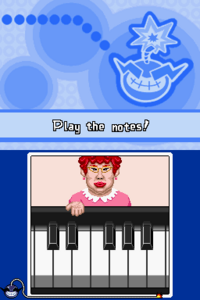 The objective of the game is to tap the same piano notes the teacher plays in the exact same order. 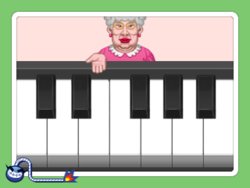 If the player taps the same piano notes the teacher played before time runs out, the teacher claps and the player wins. However, if the time runs out and the player does not finish playing the notes, or if they tap a wrong note, the teacher gets angry with the player and they lose. This microgame has twice the time to complete than the others (8 seconds); half of the time is used to memorize the piano notes and the other half is used to play the piano notes. 1st level difficulty: The player must tap two notes. In WarioWare Gold, the player must tap three notes. 2nd level difficulty: The player must tap three notes. In WarioWare Gold, the player must tap four notes, but the last note is pressed quickly. 3rd level difficulty: The player must tap four notes. In WarioWare Gold, the amount of time the notes are held down varies. This page was last edited on February 11, 2019, at 15:05.